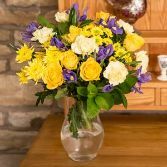 We deliver flowers from 9am to 5pm, Monday to Saturday. We do not give specified times for deliveries. If a request is made then we will try our best to fulfill your requirement. Unfortunately we do not deliver on Sundays. 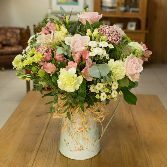 If an order is received for a Sunday it will be delivered the next working day, with the exclusion of Mother's Day and Valentines Day. For deliveries further afield (e.g. ST13 and ST10) a higher charge may apply.